(Abhiram is my grandson born nine months back in the US, I couldn’t’ visit him since then. My daughter surprised me when she called a week ago, almost screamed into the phone, “daddy I’m coming home, along with Abhiram,” and she paused and added, “it’s a brief trip, fifteen days only,” gave the details of her itinerary and hung up. Read and enjoy the fortnight of bonding between Abhiram and me). I stood a little further away from the parking lot of the local airport, eyes fixed on the arrival gate. I was there to receive my daughter from the US. Nearly a year and a half later, she has been on a trip to see me. It surprised me when she called a week ago, almost screamed into the phone, “daddy I’m coming home, along with Abhiram,” and she paused and added, “it’s a brief trip, fifteen days only,” gave the details of her itinerary and hung up. When my daughter birthed Abhiram nine months ago, I had planned to go to the US but couldn’t. Now I’m waiting to receive them. It was 10 o’clock lovely early summer morning; the airport was buzzing with blaring horns, squeaks of goodbyes, clasps of shaking hands, and a flurry of people hugging each other. I could see a good crowd waiting, anxiety speaking from the faces and tipping over with excitement to greet their dear ones the moment they could place them in the arrival passage. It’s amusing that I wouldn’t see such a wide range of emotions displayed anywhere else other than, overly exhibited, at the airports’ entryways. I woke up feeling fretful, a drift of uneasiness clouded me since morning; two years after my wife passed I was to spend time together with my daughter and son and their two kids. The previous night my son has arrived with his wife and son – Kaushal. Earlier on such occasions, it’s my wife’s prerogative to go into finer details of the setting of the rooms, food arrangements, saw to it they would stay as comfortable as her calm concern could manage. I know to step into her shoes of responsibilities as a single parent has found me both exhilarated and frightened at the same time. I’m happy that I could become a good role model and also briefly apprehensive, would I inspire the emotional security the way it pleased my children. Kaushal, the eighteen-month toddler, who stays in Hyderabad, a five-hour ride from my place, was strolling all over the airport foyer. My son and daughter-in-law are after him sweating and fussing over to fasten him in a place. I stepped out of the car walked towards the foyer where Kaushal was twirling himself going around the shops, gazing at visitors and commuters and chasing the empty trollies. His happiness rule is simple: he knows how to take care of himself, like a fighter, never staying down longer if he lost the balance. He is back again to the mad googly running only to find the tired parents unable to follow his fast bounce. All the time, though, I’m standing aside; eyes were alert following his mischief of zipping all over. My grandfatherly wisdom cautioned, “Be ready to jump in to avert any of his jolliness doesn’t end up in a misadventure.” I protectively waited. I saw a commotion at the arrival gate; it was the tired travelers strolling out with anxious faces, flickering eyes searching for their dear ones. From the soonest groups walking out I couldn’t spot my daughter, and wondered, “People for whom we stay put waiting; oddly, they are the last to march out,” mostly at airport exit gates. At last, I could see them, my daughter walking down slowly holding the nine-month-old Abhiram on her shoulder and pushing the trolley. Following the turmoil I had been through after my wife’s demise, it was my children who supported me to recover quickly and had allowed the healing time of my own. When I saw my daughter emerging carrying her son and my grandson, I possessed a fistful of pleasure, a certain fondness, and a certain emotion which appeared in my misty eyes. There he is, the nine months old Abhiram. First, I saw hesitancy before he peered at me with his inquiring look, perhaps made a quick assessment of the bearded old man. Maybe, intuitively prompted, he spread his tiny arms, paused for a moment, next, with a quick infantile move he jumped into my arms, and his wide grin never left his thin lips. My daughter relieved to see herself back to her home, tried to explain me, ‘Abhiram is an easygoing child, his is a no huff, no fuss, all smiling little one’ and added, enjoy him as much as you can the next fifteen days. Driving back home, Abhiram has made himself comfortable in my lap, gazed through the window the bright yellow summer spell and onrush of the Indian traffic. I could feel his soft body tossing in my lap; once in a while he turns his head up and beams a smile – a genuine toothless grin with a faint curve on his lips. I think it’s a gesture to ensure that he is secure in his grandfather’s restful wrap. I take a closer look at him; trying to make out does he carry any of my wife’s features. It was nine months since he was born in the US; I didn’t feel right, not so happy with myself for not able to visit him since then. I know if my wife had she been alive, she wouldn’t have allowed the work predicament stopped me from completing the visit. He is now so intimately cuddled that I could feel him: his softness, the warm press of his gentle body conveying his fondling need to be loved. As the car rolled smoothly down the road, I have let my eyes walk around him not able to resist my fascination, ‘let me see him a little more, a little closer”. He has deeply set dark, fearless, cheerful eyes, which kept rolling scanning at everything. His beaming face, as if done with an artist’s paintbrush, is lined with curvy dimpled cheeks, too soft like ice apples; merged to reach the ample expansive forehead. He has a cute way of flashing his smile with the thinly lined expressive lips mounted on a smooth chin. Once he breaks into a soft chuckle, it’s like a tickling embrace. And to complete the adorable frame, it crowned the rounded face with fine, curly bristles of an evenly spread burst of hair. For the last fifteen days, I babysit where my heart spoke to Abhiram: I’m your guardian, I’m yours forever home. I walked him out on my shoulders, watched him nap for a while. I watched his petite eyelids heavy with doziness divinely coaxed to sleep. I watched him smile and fluttering perhaps enjoying fantasies while he was in slumber. Looking at him snoozing I realized, it is very difficult not to enjoy the little frame of innocence and happiness curled up before me. I watched him shuffling with spongy legs, flapping hands blowing spit bubbles, and emit sizzling sounds. I know I’m drinking satisfaction every moment I watched him from a distance or bring him closer like a warm blanket. The whole fortnight I have been with Abhiram I’m content being beside myself with happiness. 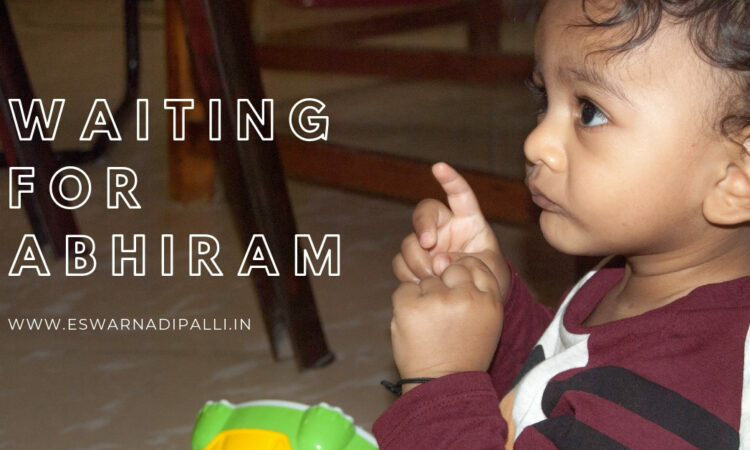 And I’m glad in those blissful moments he stayed close within my nestling reach – I didn’t count such glorious blessings in days, rather in minutes filled with supreme joy and like every second it’s been magical when Abhiram played with me.